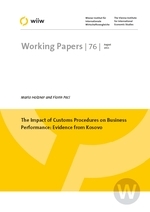 This paper aims to identify formal and informal institutional factors in customs procedures and their impact on the performance of small and medium-sized enterprises (SMEs) involved in international trade in Kosovo based on a questionnaire conducted in 2009. The econometric findings show that one of the most important obstacles encountered by SMEs are regular appeals against customs decisions that are assumed to be inter alia a consequence of frequent changes in over-complicated laws and regulations. However, there is a positive and significant effect of the formal customs institutions that facilitate the trade of imported goods, namely of so-called customs procedures with economic impact.